Benjamin Franklin is famous for his kite-flying experiment whereby he 'discovered' not electricity (as many people believe), but that lightning is a form of electricity (most people thought it was a jet of gas). A lesser known fact about Mr. Franklin is that he invented the lightning rod after realizing the electrical nature of lightning. His understanding of electric fields facilitated a implementation whereby hefty iron cabling interconnected a tall, pointed rod installed at the tallest point on a building and a spike driven into the ground. Lightning typically strikes the object that is the shortest distance (in terms of electrical field strength) from it because the discharge can begin at the lowest voltage. The presence of the grounded lightning rod above the highest point on a structure effectively brings that point all the way down to ground level, rendering it no longer as electrically tall, thereby reducing its likelihood of being struck by lightning. 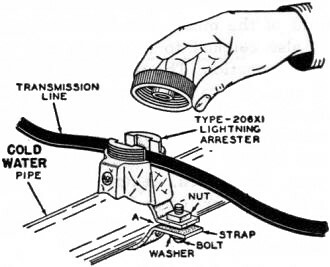 Contrary to common belief, the purpose of a lightning rod is NOT to attract lightning and provide a discharge path for the bolt. Benjamin (he insists I call him 'Ben') was a hero in Philadelphia where his invention almost totally stopped the rash of fires that occurred all around the city whenever a major lightning storm occurred. Word quickly spread and soon thereafter cities all over the world were being spared similar catastrophes after installing their own lightning rods. Chalk another one up for American ingenuity (which might be politically incorrect to point out these days). The static crashes in the receivers Mac and his red-headed assistant, Barney, were working on had been growing steadily louder and closer together; and when there came a sudden sharp peal of thunder, Mac laid aside his test prods. 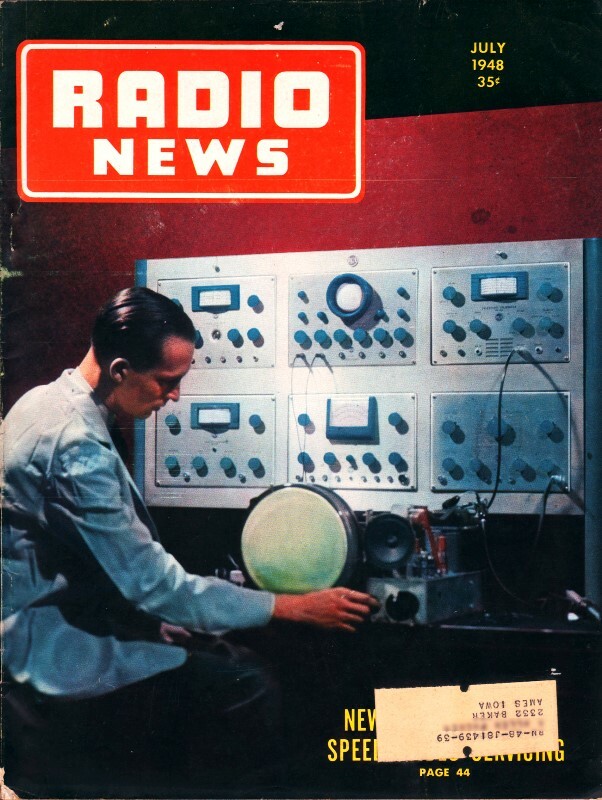 "Let's take a break, Red," he suggested as he started closing the switches that grounded the AM antenna, the FM dipole, and the TV three-element beam; "that is, if you think you can tear yourself away from your work." "W-e-l-l-l, boss, if you insist-" Red said with a very phoney-sounding reluctance. Mac tripped the circuit-breaker that opened both power leads going to the receiver outlets and the test equipment and settled himself comfortably on the end of the bench. Just then there was a brilliant flash of light accompanied by the vicious "sn-a-a-a-p!" of a near stroke of lightning, and Miss Perkins, the office force of Mac's Radio Service Shop, sailed through the door of the service department with rather unlady-like haste. "I-I just happened to think you boys might like some of these chocolates I picked up during lunch hour," she said holding out the open box in hands that were noticeably shaking. Barney hopped off the stool on which he had been sitting and offered it to her with a sweeping bow. "You feed us candy, and we will protect you from the thunder," he promised as he stretched his lanky frame on the floor and began to open and close his mouth suggestively like a three-day-old robin. "I don't think we need expect any customers for a few minutes," Miss Perkins said as she looked through the door at the rain slashing down across the plate glass windows of the shop; "and as for you, Mr. Smarty," she explained as she seated herself primly on the stool and dropped a chocolate into Barney's gaping jaws, "I am not afraid of lightning; I just don't like it." "Anyway, you had better save your strength for answering the 'phone when this is over," Mac told her as he helped himself liberally to the candy. "The lightning," Miss Perkins explained. "It always knocks out several sets. "How, Mac?" Barney inquired. Before answering, Mac lazily sketched with his left hand - it was the one with no candy in it - the diagram of Fig. 3 on the little wall blackboard at the end of the bench. "There you have the two circuits by which lightning can get into a radio - excepting, of course, the remote possibility of a direct stroke, which is a fate that I wouldn't even wish on a three-tube midget. 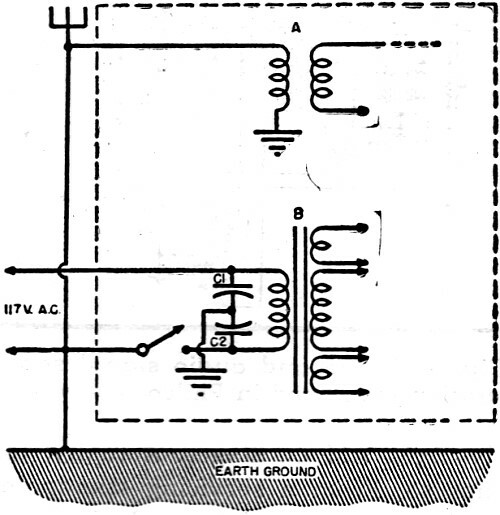 You will recognize 'A' as the antenna circuit; 'B,' the 110 volt input circuit." Fig. 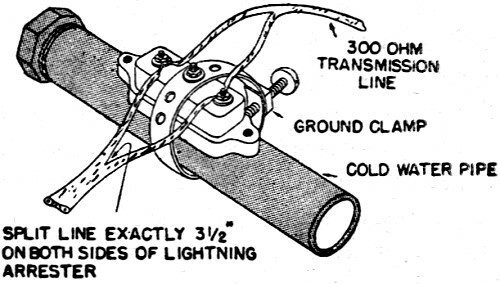 1 - General Electric lightning arrester for use with FM antennas. "Let's talk about 'A' first. If lightning strikes near the antenna, it induces a voltage in the antenna wire which flows down through the lead-in, the antenna coil, the chassis, and the ground lead to the earth. If the current is high enough, it will burn out the antenna coil; if the voltage is sufficient, it will jump to other parts of the receiver and may damage them." "How much voltage and current does a stroke of lightning have?" Barney wanted to know. "That varies, of course, with different strokes. It is estimated, though, that the voltage is around 100,000 volts per foot. That means that if the discharge leaps from a mile-high cloud to the earth, the voltage is equal to 5280 times 100,000, or more than five hundred million volts. The current varies from a few thousand amperes to a few hundred thousand amperes." Barney whistled. "If lightning strikes the antenna, then, about all you can do is pick up the pieces - if there are any pieces." Mac nodded agreement. "Yes, the things to protect against are static charges and induced voltages. Even these are pretty hefty. It has been figured that the voltage induced in a clothesline six and a half feet off the ground by a stroke of lightning three miles away is often around 30,000 volts, and this voltage would be increased by 4600 volts for every foot you raised the line. In an antenna with considerable capacity, this induced current can become high enough to do great damage." "What is the best protection against these induced voltages?" "Grounding switches would probably be best if they were always closed during electrical storms, but people either forget or are not around when the storm comes up; so lightning arresters are the best bet. You have probably noticed that I keep the shop key in that slot so I cannot get it out until the antenna grounding switches are all closed. I forget, too!" Barney waited until a window-rattling growl of thunder had subsided before asking, "How are lightning arresters made?" "There are dozens of different types. Resistor, horn gap, carbon pile, electrolytic, coated pellet, oxide disc, neon gas - these are a few; but the important thing is what they do. A lightning arrester is simply a device that has a high resistance to the passage of current until a certain critical voltage is reached, at which time it develops a low resistance that allows the high voltage to go to ground. After this is done, it returns to its former condition. It is placed between the lead-in and the ground, usually just where the lead-in enters the house." "Most sets have built-in antennas now, though, don't they?" Miss Perkins asked. "Outside of FM and TV sets, yes," Mac said. "But since these came along, people are once again trying to get their antennas as high and as in the clear as possible - right where the lightning likes to have them." "I'd think a lightning arrester would upset the balance of a twin-lead lead-in," Barney offered. "Ordinary ones would, but the engineers are bringing out new ones that don't." Mac opened a drawer and tossed a couple of objects to Barney. "That long arrester is made by G.E. and the round one is RCA. Both are made to clamp on a water-pipe, and both are especially designed for use with twin-lead lead-ins from FM and TV antennas. Some antennas of the folded dipole type are arranged so that grounding the supporting mast also grounds the antenna itself at a voltage node and so affords lightning protection without impairing the efficiency of the antenna." Fig. 2 - RCA lightning arrester for use with FM and television antennas. "How about the damage done by lightning coming in over the line?" "That is much more common in my experience than antenna damage," Mac said. "What happens is that high voltages are induced into the power lines, sometimes at a point some distance from the receiver, and it is piped right into the set by way of the line cord. Once inside, it may raise all kinds of hob, such as arcing the line switch, blowing condensers, burning out tubes, breaking down the insulation of the power transformer - and I once saw where it had welded the tuning condenser plates into a solid mass." "Does it usually do all that?" Barney asked in awe. "Fortunately, no. The most common damages are the blowing of line-filter condensers, ruining of line switches and associated tone or volume controls, and burning out of antenna coils." "Wup! Wait a minute there!" Barney exclaimed. "How is lightning that comes in over the power line going to hurt the antenna coil?" Mac grinned approvingly at the boy's alertness and pointed at the diagram on the blackboard. "Remembering that half the sets in town have the antenna posts attached to the ground because the owners are too lazy to put up antennas, suppose a voltage surge comes in on the ungrounded light wire and breaks through the insulation of C1 to the chassis and proceeds through the chassis and the antenna coil to the ground. The surge does not have to do all the work. All it has to do is break down the insulation of C1, and then the line current will follow this path and burn the fine wire of the antenna coil primary to a crisp." Fig. 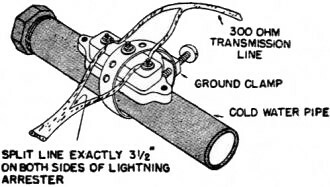 3 - If antenna terminal is connected to an external ground, lightning surge may break down C1, thus shorting line through the primary of the antenna coil. "Tell him about the sets that turn themselves on," suggested Miss Perkins, who was taking more interest in the conversation now that the thunder had subsided to a distant growling. "Well," Mac said, "suppose the surge does not puncture C1 but does cause the insulation of C2 to break down. 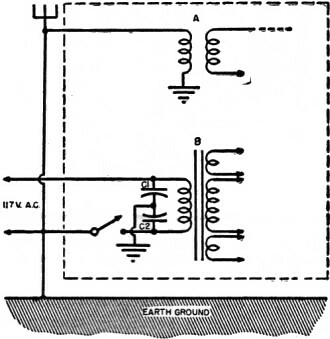 Then the line current can flow right through the transformer primary, C2, the chassis, the ground lead, and the ground back to the grounded side of the pole transformer, effectively bypassing the receiver switch. People get pretty excited when their sets turn themselves on during a thunderstorm and they cannot turn them off. "What is the best protection against these line surges?" "The best protection is for the customer to pull the plug out of the wall socket during thunderstorms, and I warn all my customers to do that. One thing I have found helpful is to put in d.p.s.t. switches in place of the usual s.p.s.t. type used in receivers. By breaking both sides of the line, you increase the arc path, and you remove the vulnerable line-filter condensers from the line except when the set is turned on." He was cut short by the shrilling of the telephone, and Miss Perkins ran to answer it. 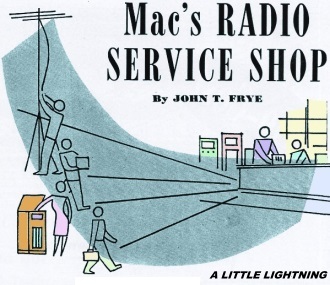 "Mac's Radio Service Shop; good afternoon!" "You say the receiver started playing without anyone's touching it, and now you can't turn it off? Well just pull the plug out of the wall socket and leave it out. Do not try to plug it back in or you may blow a fuse. We will pick it up in a few minutes." Barney looked first at Mac's teasing grin and then at Miss Perkin's satisfied smile. "How smug can two people look?" he asked in mock disgust.